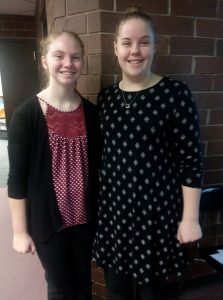 Lynnville-Sully speech and drama teams were among many across the state competing in the Large Group Speech Contest on Saturday, Jan. 20. Two of Lynnville-Sully’s five acts are advancing to state competition after receiving Division I ratings. Lynnville-Sully’s Andrea Bogaard and Madison Johnson will bring their “Airline Calamity” ensemble act to the state competition to be held Saturday, Feb. 3, as will the “Bloodwork” choral reading group of Maddeline Mintle, Kayla Van Dyke, Kaylee Maasdam, Tessa Van Maanen, Maren Egging, Shiloh Cunningham, Shaleah Van Wyk, Mary Kate Shaver, and Hunter McCoy. 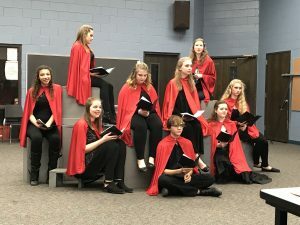 Lynnville-Sully’s choral reading group performs “Bloodwork” at district speech Jan. 20. Madison Johnson and Andrea Bogaard advance to state speech with their Division I-rated “Airline Calamity” ensemble act.